I am constantly seeking out our local thrift shops and church flea markets for some deals on vintage items. I usually am always able to scoop up some great finds. You would be surprised that someone’s junk can be someone else’s treasure. From experience, I know that many elderly people are often cleaning out their closets or their entire houses in order to downsize. In fact, that is exactly what my parents have been doing this winter to prepare for their yard sale in the spring. Their reasoning is that they don’t need so much stuff anymore and that someone else can use it. Of course, their treasures have to pass through me before it makes it to the yard sale box. 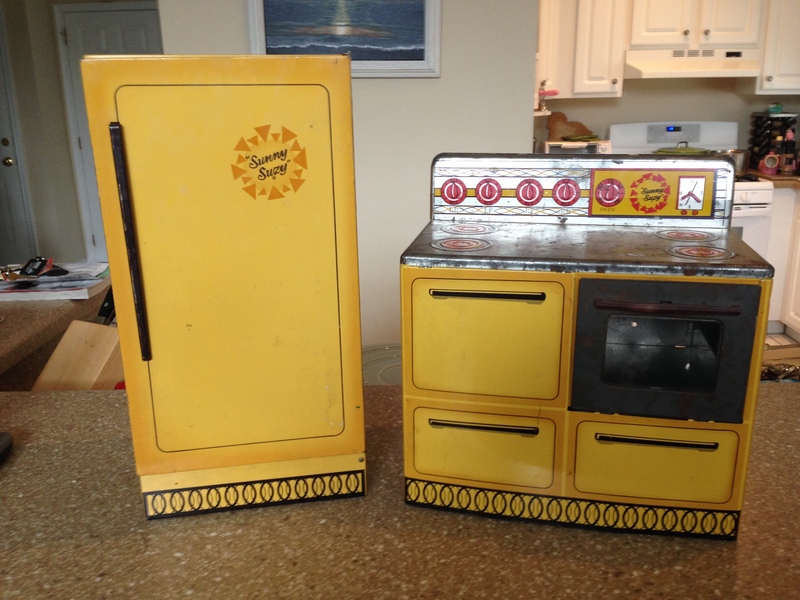 Check out what I have recently acquired at a local church flea market at Our Lady of Sorrows in Linwood, NJ. 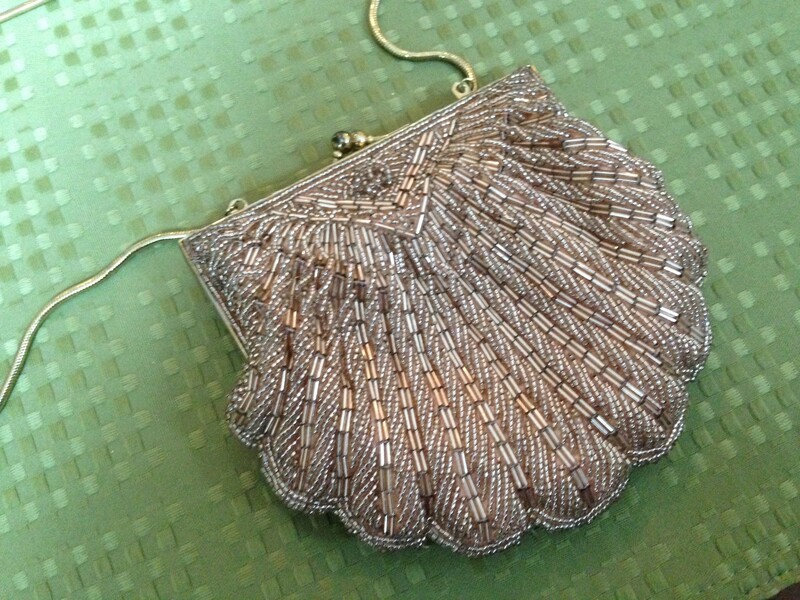 This beaded purse was a steal at $10. I talked to the dealer and she said that she now went around to different flea markets selling items as a result of cleaning out her mother’s house after she had passed away. 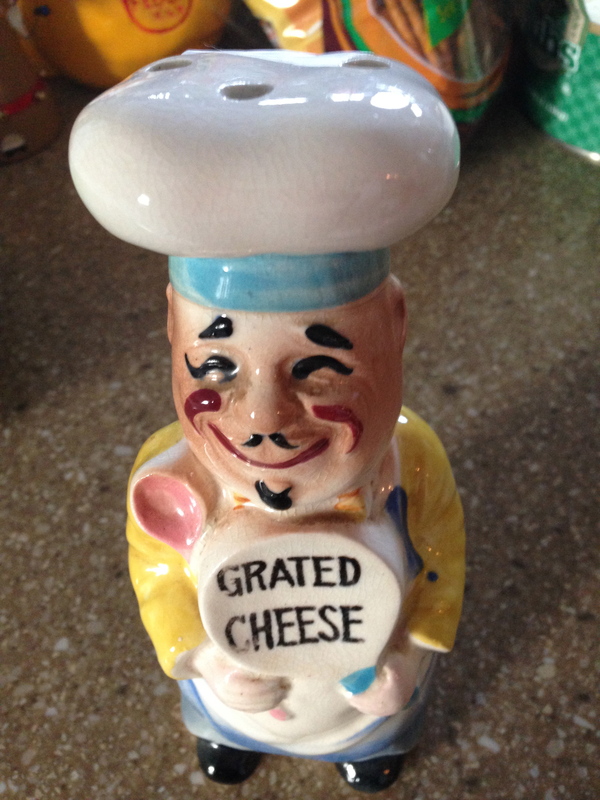 This grated cheese man matches a utensil holder I found last year. I got him for $12. This is a hard piece to acquire. I got this children’s play set for $15. This is only a part of a complete set but it was well worth it as it made a great addition to the decor above my kitchen cabinets. Yesterday I was at one of my favorite places, Days of Olde Antiques. I always find something when I go because they have a ton of antiques to choose from. They get a lot of traffic, which means that there is always something new to look at. When I was there last month, my mom bought me some things for my birthday presents. It’s always more fun when you don’t even have to pay for it yourself. Yesterday, I was able to make the most of my budget. Here’s how things went down. 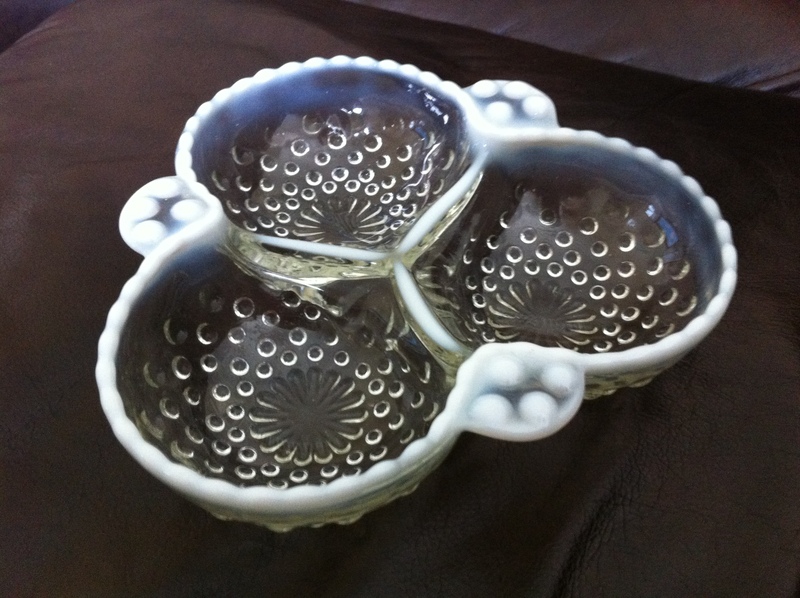 I decided that I was going to purchase this small candy dish to match some other pieces I have in my Anchor Hocking moonstone hobnail collection. I acquired some pieces from my grandmother. I just couldn’t resist this small $12 purchase. As I was making my purchase, the person ringing me up just happened to be the owner of the booth that this piece came from. He said to me, “I’m willing to sell you the rest of my collection at a reasonable price.” I remained calm and nonchalantly said, “I’m willing to hear you out.” He took me over to the booth to see what his collection entailed. I was amazed at how many pieces he wanted to unload. There were so many pieces that I thought he would tell me a very high number. To my surprise, he said “I can do $100.” Well hell yeah! That’s what I was thinking in my head. I told him that I would be happy to take it off his hands at that price. He said he has about 50 more boxes of glassware at his house that he needs to unload. I’m looking forward to checking out what he puts in its place. 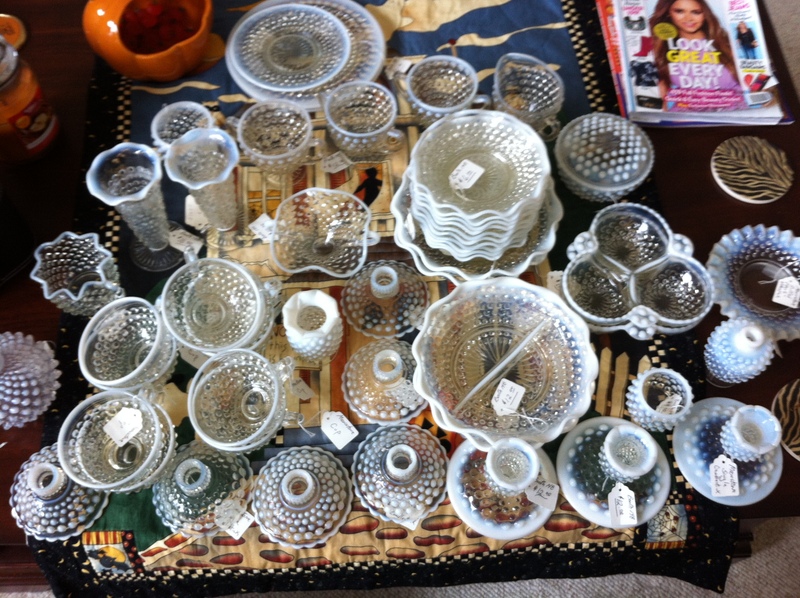 I just unpacked the glassware and have valued it at over $350. Looks like I hit the jackpot. 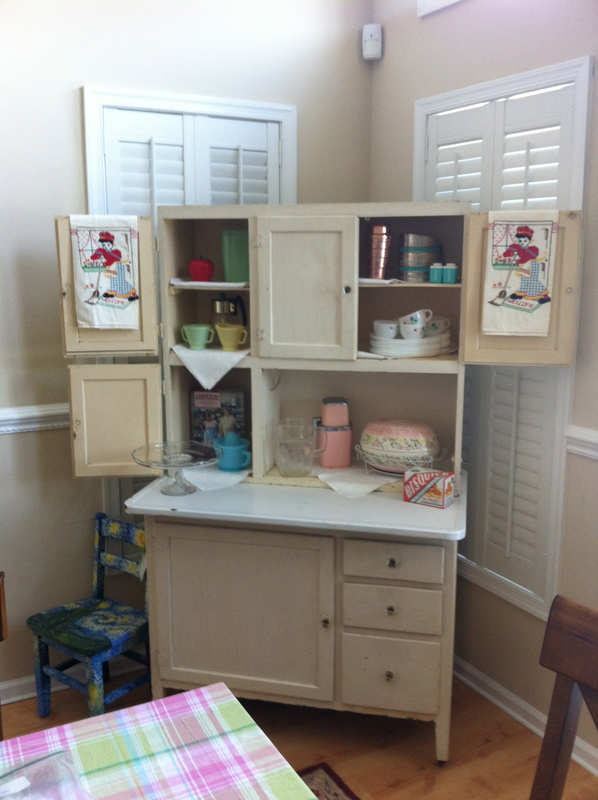 I promised you a picture of my decorated Hoosier cabinet that is on display in my dining area. When company comes, it will double as a buffet table. But for now, it is the focal point of my dining area and quite the conversation starter.